A little-known piece of trivia is that the Osmond Brothers only began performing so that they could raise money to help their deaf brothers, Virl and Tom Osmond. 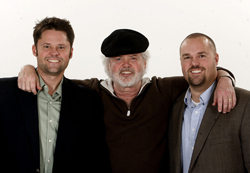 More than a half-century later, the lead singer of the Osmond Brothers, Merrill Osmond, is using his talents to once again raise money to help those with hearing loss, while entertaining Utahns from throughout the Salt Lake valley. Merrill, with support from his sons Justin and Shane, has written and will produce the Youth Pioneer Pageant on July 20, 21, 23 and 24, with proceeds earmarked for the Olive Osmond Perpetual Hearing Fund. The Olive Osmond Perpetual Hearing Fund is a non-profit founded in late 2010, named in honor of Olive Osmond, the late matriarch of the performing Osmond family. The four-day event at the West Jordan Arena will feature top-tier performers along with more than 1,000 children and young adults from around the country as their share stories about Utah’s settlers through dancing, singing, and theatrical entertainment, Merrill said. Auditions will commence in March, he said. Despite being held around Pioneer Day, the event will be non-denominational, Merrill said, with the children also celebrating the contributions made by Catholic missionaries, Greek and Italian pioneers, Chinese and Jewish settlers, and the Native Americans of Utah. “We want to portray the legacy of what happened here,” said Justin, who was born 90-percent deaf himself. The trio hopes the event becomes an annual event in Utah, similar to Provo’s Independence Day celebration Stadium of Fire, which Merrill has served as executive producer of. The Youth Pioneer Pageant will also feature wagons, handcarts, live animals, and a large fireworks display at the end of each evening’s program, In addition, a military fly-over has already been confirmed by The Pentagon. “It helps to know Orrin Hatch,” Merrill said of the Utah senator. Ticket will go onsale on April 23, and the prices will be kept low, likely ranging from about $10 to $20, Shane said.